In 1980, Roberta Williams and her husband, Ken, founded a company named On-Line Systems. Shortly thereafter, they released their first product: Mystery House. 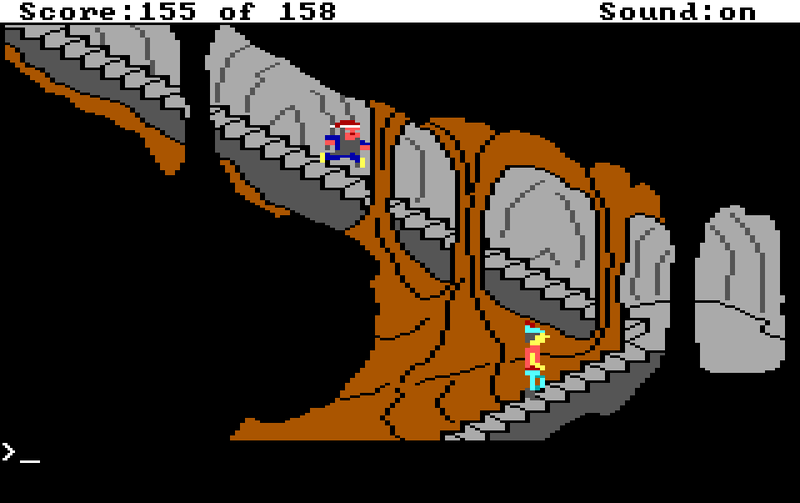 This Apple II title stood out from the pioneering Colossal Cave Adventure and all of the adventure games spawned in the wake of its success by featuring graphics. Before that moment, adventure games were like interactive novels – they conveyed stories and plot developments exclusively through text. The idea that one could interact with the environment and see the changes their actions had on it was groundbreaking at the time. As a result, Mystery House ended up selling nearly 80,000 copies worldwide over the next two years. 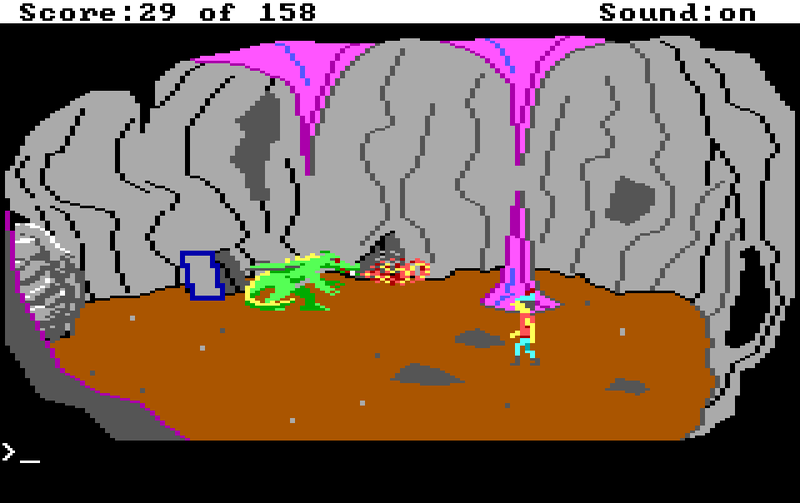 Fueled by her success, Ms. Williams created four more games in the following years for the Apple II platform: Wizard and the Princess, Mission Asteroid, Time Zone, and The Dark Crystal. The last of these was based on the 1982 high fantasy film of the same name directed by Jim Henson and Frank Oz. In the midst of these successes in late 1982, the famous computer company IBM contacted On-Line Systems, then known as Sierra On-Line, with an interesting proposal. They were putting the finishing touches on the PCjr home computer. This new model was to retain the IBM PC’s central processing unit and BIOS Interface, but with an array of improvements, including enhanced graphics, slots for ROM cartridges, joystick ports, and an infrared wireless keyboard. With the opportunity to bring her work to a new platform, Ms. Williams accepted IBM’s proposal. This new game was to be a departure from any of the ones she had developed for the Apple II computer. While her previous work consisted of static images presented from a first-person perspective, Ms. Williams sought to include animation. In her words, it was to be “the ultimate cartoon – a cartoon [the audience] can participate in”. To this end, programmer Arthur Abraham developed a prototype. Though he wouldn’t remain on the team by the end of the project, this prototype formed the basis for the game’s engine. Ms. Williams and her team of six full-time programmers worked on the game for eighteen months, official releasing it in May of 1984. Its name was King’s Quest. 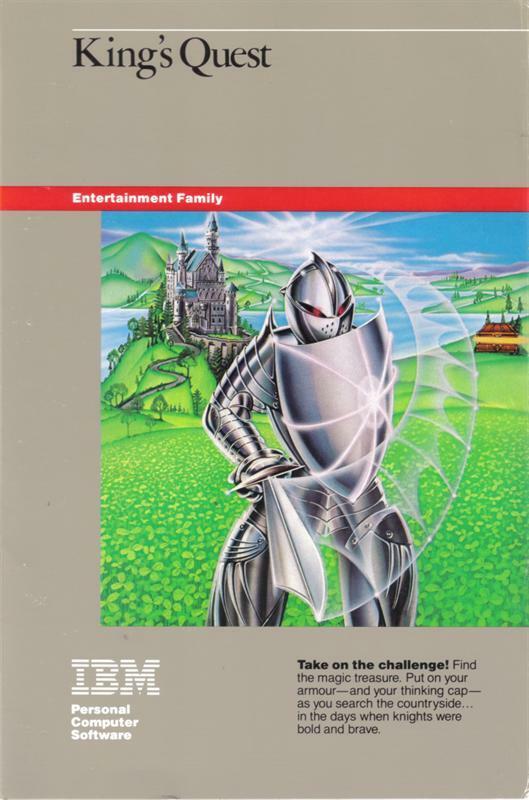 IBM heavily promoted King’s Quest and their PCjr system, making sure to highlight its realistic animation and variety of sound effects. This made their ultimate decision to discontinue the product less than a year later all the more shocking to Sierra. As a result of the PCjr’s poor reception, King’s Quest itself didn’t sell well. However, Sierra wasn’t about to let their hard work go to waste. Using the development system, they were able to port the game to the Tandy 1000, the Apple IIe, and standard PCs. With King’s Quest widely accessible, it quickly became a bestseller. 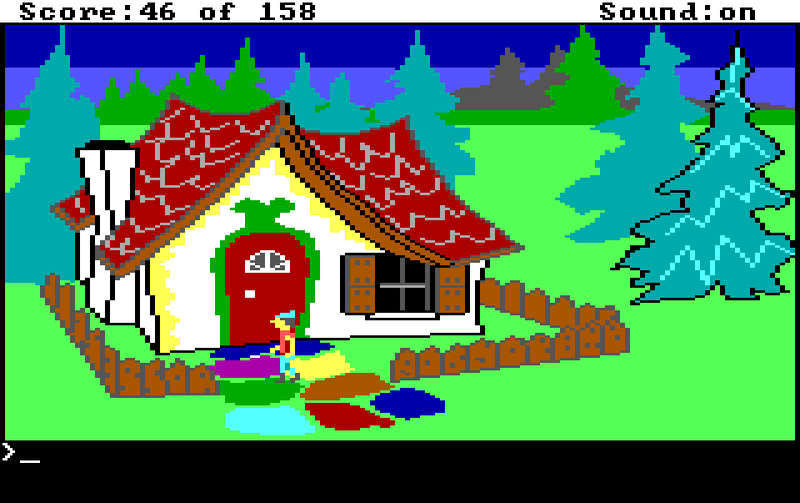 To historians, Mystery House provided the blueprints for the adventure game formula while King’s Quest perfected it. Does it still hold up as one of the greatest adventure games of all time? WARNING: This section will spoil certain puzzle solutions. A long time ago, the Kingdom of Daventry prospered under the rule of King Edward the Benevolent. Beloved by his subjects, he aided his people with three magical items. The first was a magical mirror that could foretell the future, allowing them to perfectly adapt to any adversity. The second was a shield capable of withstanding any kind of attack, making its wielder invincible. The last was a chest containing an endless supply of golden coins, ensuring his subjects were want for nothing. Unfortunately, these times were not to last. The last few years saw the crown’s treasures stolen by evil forces. Knowing that his time is short, King Edward sends his bravest knight, Sir Graham, to recover the lost treasures. As King Edward has no heir, if Graham succeeds in his quest, the latter will become the next king of Daventry. Enthusiasts knew shortly after hitting the “ENTER” key that King’s Quest was unlike anything they had ever played before. The only similarity it shared with any of Ms. Williams’s previous games was the text parser on the bottom of the screen. Otherwise, they found themselves in an entirely foreign situation. Mystery House and a majority of the games that followed starred featureless protagonists. Their personality mimicked the player’s perfectly because the two were essentially the same entity. They may as well have beamed into reality the exact second the player loaded the game. When Ms. Williams’s games took place from a first-person perspective, she could take advantage of the protagonist never being shown onscreen by having the events happen to the players themselves. For King’s Quest, she desired to create a game in which players controlled a little character running around at their behest. Suddenly, the approach she had taken with Mystery House was now untenable. By designing a definable, objective model for the player character, she realized he also needed a name and a backstory, hence Sir Graham. 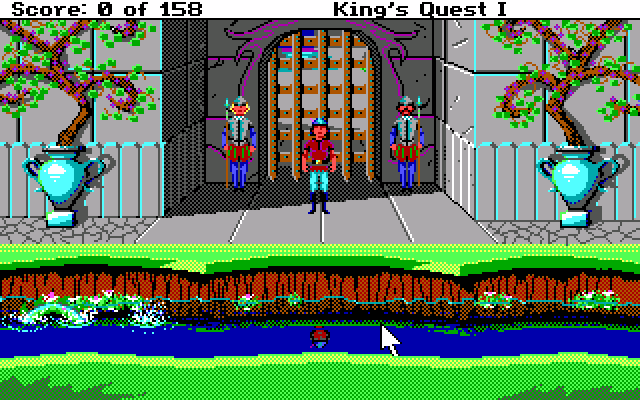 Because King’s Quest was made before mice became commonplace, Sir Graham’s movements are controlled using the arrow keys. The text parser functions exactly as it does in any other adventure game. Most valid commands consist of a verb and an object. It is not necessary to form complete sentences in order for the text parser to understand your intent. Sentences such as “OPEN DOOR” and “TAKE CARROT” are perfectly valid. You can therefore omit definite and indefinite articles when typing commands. However, because Sir Graham has a definite location in a given screen, there is a new factor players had to take into consideration. Specifically, if one wished for Graham to interact with the environment in any way, they couldn’t realistically expect him to do so from a distance. Instead, players had to ensure he was within close proximity of the prop they wished for Graham to manipulate. To put it another way, the above screenshot shows that Graham’s arms are not long enough to reach the door from the ground. You must instead guide him to do the door for your command to have any kind of effect. This applies to nearly every other significant interaction present in King’s Quest – whether it’s taking an object, talking to a character, or even examining certain aspects of the world. One of the biggest improvements King’s Quest brought to the table lies in its interface. With a press of the “Escape” key, players can access the control panel. Here, there are six options, allowing the player to make numerous alterations to the game: Info, File, Game, Action, Special, and Speed. “Info” contains basic information on the game, which includes an explanation of the controls. “File” allows one to save, reload, restart, or quit. Because Graham’s journey will prove to be a perilous one, it’s prudent to save frequently, lest you lose your progress. “Game” allows King’s Quest to showcase its markedly more sophisticated inventory system. 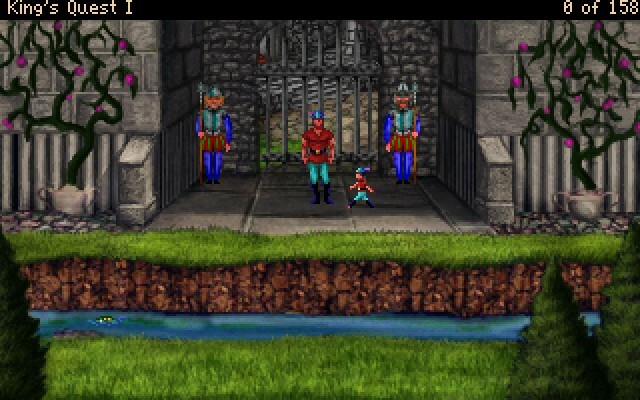 Even when graphics were incorporated into adventure games, the onus was typically on the player to recall what the protagonist had on their person at a given time. 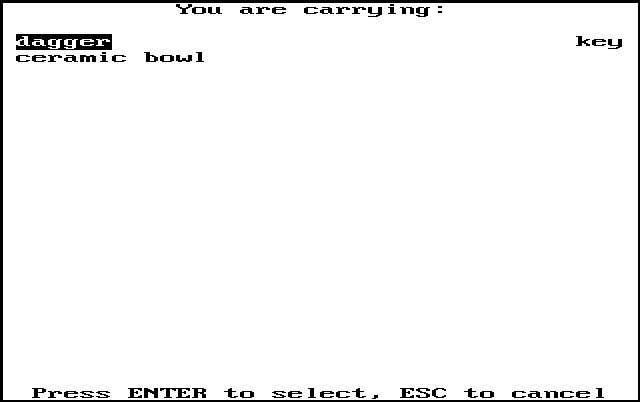 A list was usually displayed by typing “INVENTORY” into the text parser. If the object needed to be examined, players had to type “LOOK [OBJECT]”. Because actions in text adventures caused time to advance, these extra actions could cost the player their chance to win. In King’s Quest, not only does time stop whenever one accesses the menu, the inventory screen itself is far more user friendly. By choosing “See Object”, you are given a list of Graham’s items. By highlighting an item and pressing the “ENTER” key, you are given a description along of it along with a picture. One item simply lying out in the open, a magical bowl, even requires the player to examine in closer detail to learn how they can fully utilize it. “Action”, true to its name, contains a number of actions Graham can take. Two of the three actions, Duck and Jump, can only be utilized on the ground. The exception, Swim, is obviously only ever used in water. Amusingly, Graham will flail around helplessly in water until you issue the command for him to begin swimming. After that, he suddenly remembers how to swim. “Special” contains miscellaneous functions. One of which allows players to enable and subsequently control Graham’s movements with a joystick. They can also toggle the sound effects on or off and pause the game. In DOS versions, the last of these functions is fairly redundant given that accessing the menu pauses the game anyway and it does not work on a timer. Even entering an invalid command and leaving the text onscreen effectively produces the same result. Lastly, “Speed” too has a self-explanatory function. The player has a choice between three different game speeds: slow, normal, and fast. While “slow” and “normal” set the game at appropriate speeds for those descriptions, “fast” is a marked step up for most computers. Specifically, “fast” causes the computer to process the game at maximum speed. This option makes the game completely unplayable on modern computers. Given how dangerous the Kingdom of Daventry has become, you do not want Graham running at a blindly fast speed. If he does, he will inevitably march straight to his untimely death. It should be noted that adjusting the game’s speed affects its internal timer as well. For example, if Graham falls in a body of water, you have a short window of opportunity with which to issue the “swim” command before he drowns. This window is drastically reduced if he falls in with the game set to its fastest speed. This holds true for any other timed event as well – increasing the game’s speed will cause the timer to count down far more quickly in turn. King’s Quest cost $850,000 to develop. 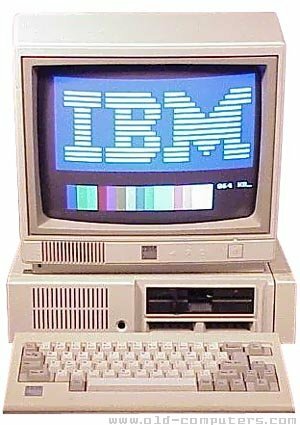 In order to entice potential customers to try out the PCjr, IBM covered a majority of this cost. In exchange, they requested a sophisticated adventure game that was also replayable. This is where the scoring system comes into play. King’s Quest has a total of 158 points for the player to obtain. Though the score can give one a general idea of how close they are to completing their quest, it is entirely possible to complete the game without having obtained every single point. This is because a majority of the puzzles you encounter in King’s Quest have multiple solutions. There’s usually an ideal situation that rewards players for thinking outside of the box. For simpler solutions, players are rewarded for their pragmatism, but with fewer points. A select few solutions can even result in the player losing points. It could lead to someone believing they did the wrong thing, but this isn’t necessarily the case. The magic mirror is found in an underground cavern at the bottom of a well. Actually getting the mirror is easier said than done, for it is guarded by a ferocious, fire-breathing dragon. There are two main methods of dealing with the dragon. One of the first items the player will likely have obtained is a dagger. The simplest solution is to have Graham chuck the dragger at the dragon, killing it instantly. Alternatively, he can use the dagger to free the well’s bucket and fill it with water. Graham can then throw the water at the dragon, extinguishing its flames. Embarrassed, the dragon will exit the cave. This solution not only grants the player extra points, it also opens up a shortcut leading outside. Ms. Williams aimed to make King’s Quest an interactive cartoon. This sequence fits with that goal because while the story takes itself fairly seriously, it wouldn’t have felt out of place in a Saturday morning cartoon. A typical fantasy game in 1984 was, in practice, no different from the dime-a-dozen action titles flooding the arcades at the time. Whether the player faced down cyborgs or dragons, their goal was the same: kill everything in sight. What I like about King’s Quest is how Ms. Williams took the basic premise on which games of its era operated and openly asked why things had to be that way. Accordingly, players are invariably awarded the most points for finding peaceful solutions to their problems. A few exceptions exist, but it was a very forward-looking concept for its time. Though inventory management had been a staple of adventure games since their inception, King’s Quest fully cemented one of the genre’s golden rules: take anything that isn’t nailed down. There is no such thing as a useless or detrimental item in King’s Quest; everything in the game has a deeper reason for having been coded into it. Graham may find various treasures on his journey, but they are not meant to have a higher purpose than to award the player points. The player can use them to bribe certain characters, but this will result in a deduction of points. This is what allowed King’s Quest to stand above its contemporaries. While adventure games before 1984 would often feature a single solution apiece, King’s Quest allows players leeway. Some solutions are objectively better than others, yet the game can still be won even if the players opt for the direct approach. Though King’s Quest was an admirable effort for 1984, the passage of time revealed it has its fair share of flaws. To preface the following criticisms, I do realize that the medium was quite young in 1984. The first wave of adventure game developers often crafted their experiences the way they did because they hadn’t grown up with the medium. This aspect was a double-edged sword. On one hand, it encouraged innovation. The only way one could possibly stand out from the crowd was to make as unique of a game as possible. It also ensured that developers were not guided by nostalgia, for no such sentiments could possibly exist. Where this ethos fell short is that developers often introduced overtly annoying aspects in their games. While many of them would get mocked in the following decades, such observations could only realistically be made in hindsight. To begin with, anyone attempting to play this game will doubtlessly have problems with its text parser. It’s not what I would call uncooperative, but players may be taken aback by the fact that simply typing “LOOK” results in the game requesting clarification instead of a description of the immediate area. The game doesn’t understand the word “AREA”, so oftentimes, the only way to get a description of the immediate area is to type “LOOK ROOM”. Though this may seem obvious, it’s not intuitive to use the command in an outdoor location – and even then, it doesn’t work on every single screen. This could result in the player failing to notice important details in a given screen. Other than that, quite a lot of the challenge of using the text parser is the result of learning the game’s vocabulary. Sometimes, seemingly valid commands get rejected simply because the developers didn’t anticipate the player’s writing style. Another major flaw with the game concerns its puzzle solutions. In the interest of fairness, I will say that the solutions aren’t usually needlessly cryptic. In fact, when one compares King’s Quest to Infocom’s adaptation of The Hitchhiker’s Guide to the Galaxy, the former is downright amiable by comparison. In fact, my favorite facet of the game is how it often alludes to classic nursery rhymes and children’s tales. One of the greatest appeals of the game was the ability to place oneself in the shoes of these often doomed protagonists and demonstrate what you would do instead. While Hansel and Gretel were tricked by the witch into entering her house, being made of gingerbread, Graham can simply walk away from the situation if he hears her famous line. Indeed, with one major exception, the puzzle solutions follow a strand of reasonable logic – fantastical or not. However, that one exception is the basis of what is perhaps the most infamous puzzle of its day. In fact, anyone who has cleared this game knows exactly what I’m about to disclose. Upon getting to the other side of a bridge guarded by a troll, Graham happens upon a gnome. He offers Graham a reward if he can guess his name. Even the youngest kids would respond to this by immediately typing “Rumpelstiltskin” into the parser. They would then be taken aback when the solution is rejected, though the gnome claims you’re on the right track. What’s the gnome’s true name? As it turns out, the witch’s house contains a message stating the importance of occasionally thinking backwards. There is little chance that anyone playing without a guide would link the gnome with this message considering they are in completely different areas of the game. However, in the unlikely event that they were to extrapolate the message being a hint for deducing the gnome’s name, “Nikstlitselpmur” isn’t the correct answer either. What the player was supposed to do was write the name “Rumpelstiltskin” down on a piece of paper and transpose each letter with its opposite. To do this, one would need to write the alphabet twice: once in its normal order and once in reverse order. Using this backwards cypher, A becomes Z, B becomes Y, C becomes X, and so forth. By going through this needlessly obtuse process, they would be left with “Ifnkovhgroghprm”. On top of being unintuitive to a truly astonishing degree, it’s very easy to misspell, not even remotely resembling a word that exists in any language. This could falsely lead somebody to believe the solution is incorrect. The sole saving grace to this puzzle is that it’s not required to complete the game. If Graham is unable to guess the gnome’s name, he is given a key that opens a door on the side of a mountain. Inside is a stairway to the heavens above. Meanwhile, should Graham correctly ascertain the gnome’s identity, he is given magic beans. Just like Jack before him, Graham can grow a giant beanstalk by planting them in fertile soil. 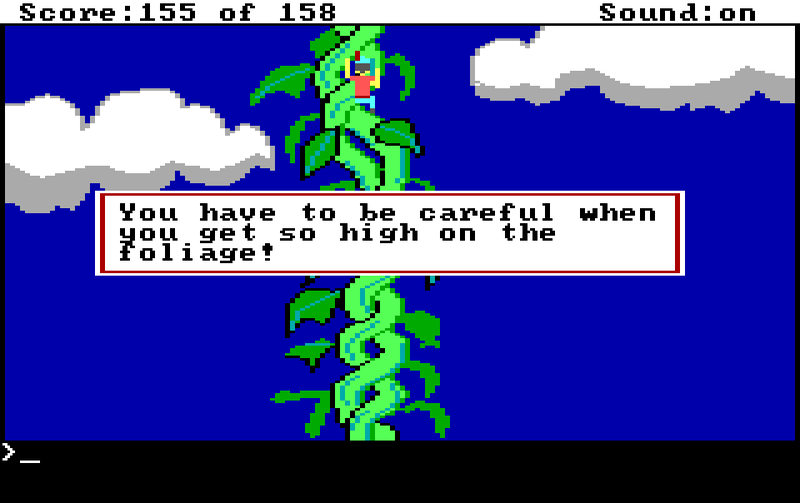 Based on this situation, one could reasonably assume the beanstalk would be easier to climb than the staircase. Such a conclusion, though logical, is incorrect. 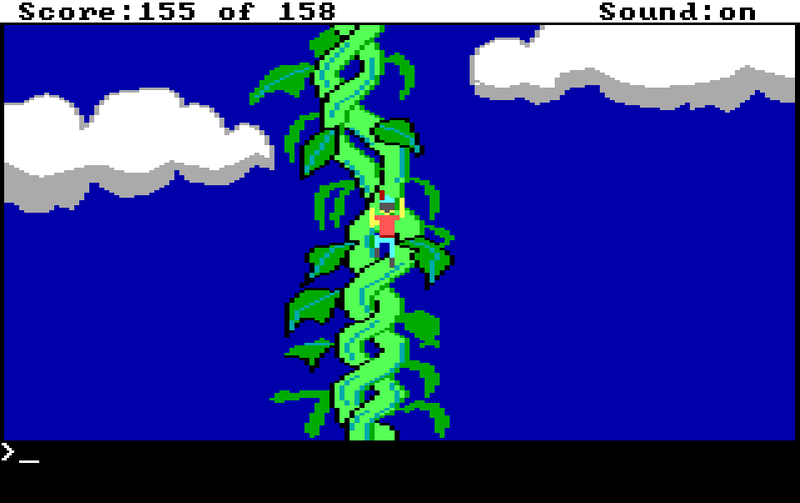 Climbing the beanstalk is, without a doubt, the most annoying part of the game. Touching any of the edges of the beanstalk will cause Graham to plummet to the ground. There is absolutely no indication as to which part of the beanstalk is safe to climb; and if you so much as graze the boundary, you’re dead. You can exploit a glitch by having Graham latch onto the beanstalk as he’s about to make contact with the ground. However, this doesn’t change that climbing up the beanstalk is a matter of making small increments of progress, saving, and reloading when you inevitably fall off. Considering that the staircase is much easier to navigate, one might wonder what the point is in obtaining the magic beans in the first place. As it turns out, a dwarf occasionally patrols the staircase. Though he’s not a danger to Graham’s life, he will steal a treasure from him if the two of them collide. It is especially detrimental if he steals one of the three treasures because it will place you in an unwinnable position. The inability to win the game despite your character being alive is frequently dubbed a “Dead Man Walking” or “Walking Dead” scenario in certain circles. This is one quality that makes approaching classic adventure games from a modern standpoint next to impossible, as later creators would rightly abandon the idea. 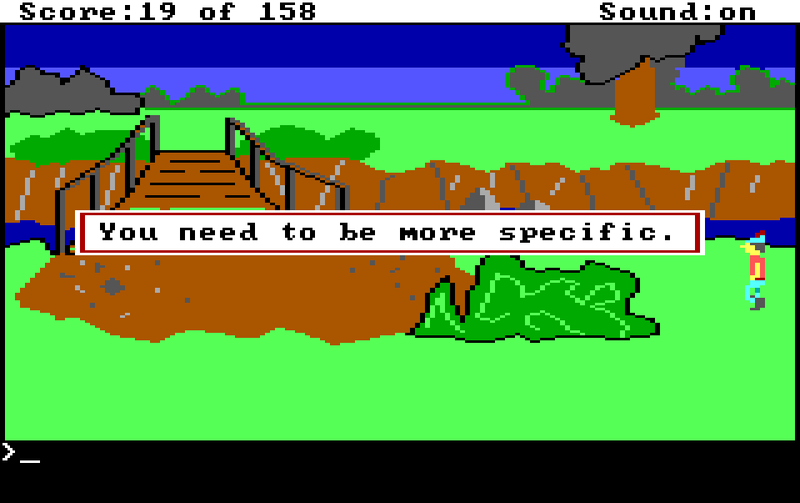 King’s Quest itself deserves some credit in that it’s usually obvious when you’ve entered such a state. Usually, you’ve only made your game unwinnable if one of the three treasures has been stolen, and nobody paying even the slightest bit of attention is going to save in such a situation. Not only that, but the dwarf can be circumvented if you have a magic ring that turns Graham invisible. This renders the nominal benefit of climbing the beanstalk moot; the easiest legitimate way to make a return trip would be to go down the staircase. Along those lines, one of the worst aspects of King’s Quest is the apparent result of transplanting one particular RPG element into an adventure title. You will be exploring a seemingly innocent section of Daventry only for a hostile to appear out of nowhere. These enemies include a wolf, an ogre, a witch, the aforementioned dwarf, and a sorcerer. The sorcerer freezes Graham in place, allegedly leaving him susceptible to any of the remaining four threats. The reason I say “allegedly” is because these dangerous screens only have a chance of spawning one particular threat. Because of this, the sorcerer is, at worst, a minor nuisance. The same couldn’t be said of the wolf, the ogre, and the witch; all of them simply kill Graham outright upon capturing him. These situations are similar to what RPG enthusiasts would call random encounters. What Ms. Williams inadvertently proved is that this mechanic had no business existing in an adventure game. There is a bit of mercy in that none of these screens contain anything important, but it doesn’t change how you must learn where these dangerous areas are in the first place through trial-and-error. It’s jarring to be wandering the countryside only for a text box to appear telling you Graham is in danger, which isn’t helped by an annoying musical cue courtesy of the PC speaker blaring loudly at you. When playing this game in an apartment or with sleeping family members nearby, enthusiasts often had to scramble for the “F2” key to disable the sound immediately upon loading it. In the PCjr version, enemies would appear onscreen instantly, making it easy to simply leave the area. When ported to other computers, it was changed so that they appear a few seconds after entering it. This may have been an attempt to make the game more difficult, but no matter how they implemented these random encounters, they didn’t add anything substantial to the table. Dealing with them isn’t challenging; all you have to do when a threat approaches you is leave the screen. If you have enough room, you should be fine. If not, you lost the game for no other reason than because it said so. I will admit that none of these problems are deal-breakers, but they are an indication of how much this game has aged in the decades since its release. 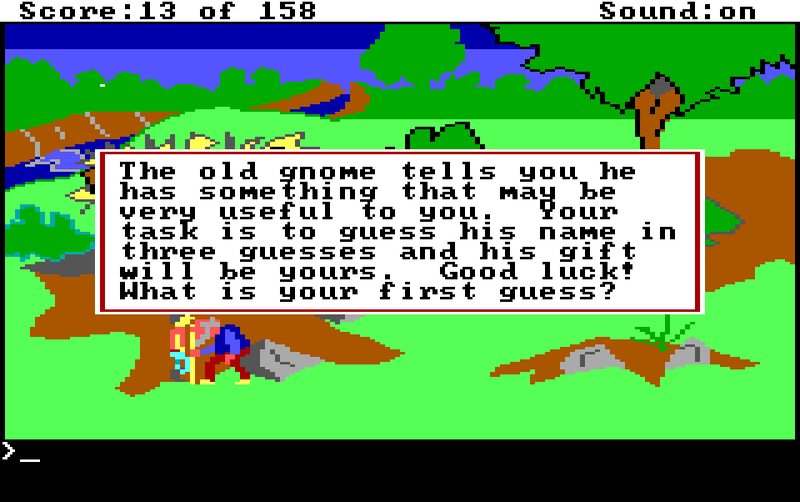 In the grand scheme of things, King’s Quest comes across more as an adventure-game style guide than a fully formed product in its own right. Given that it was one of the first adventure games to be played from a third-person perspective, it’s astonishing it has held up reasonably well given the unreasonable challenges contemporaries threw at players. Nonetheless, playing the game in its original form is a tricky proposition. Sierra seemed to realize this problem ahead of time because in 1990, they remade King’s Quest in their more sophisticated SCI engine. Reading about its reception is a fascinating case study about how different gaming culture was back then. Specifically, when Sierra announced that King’s Quest was being remade, the fan response was overwhelmingly negative. These were not the sentiments of a vocal minority either; when the remake saw its release, it was a commercial failure. Fans deemed such an idea blasphemous, drawing comparisons to the colorization of black-and-white films – a practice considered highly controversial among cinephiles. Sierra planned to remake the following installments, yet the negative reception to the first ensured it wasn’t to be. Meanwhile, remakes for popular games are fairly common these days. Cynics may roll their eyes and claim the company behind a given remake is attempting to print money without creating something new, but you usually won’t see a preemptive backlash of this magnitude. Some dedicated fans might even go the extra mile, band together, and remake a popular game themselves as a true labor of love. In fact, a group calling themselves AGD Interactive wound up doing just that in 2001. The result updated the graphics of the official remake, utilizing VGA colors and eschewing the text parser in favor of a user-friendly point-and-click interface. It was so well-received that many fans have admitted to liking it more than the original. Later versions even removed any possible “Dead Man Walking” scenarios, allowing players to experiment without consequence. Because of this, I have to say if you’re at all interested in trying out King’s Quest for yourself, I would recommend playing one of the remakes over the original. Because of its fairly basic premise and design, it could serve as a great tutorial for newcomers attempting to discovering adventure games. It may no longer have a claim as one of the greatest games ever made, but its influence on the medium speaks for itself, and nothing can take that accomplishment away. “You cannot reach the door from here”… oh come on, man, that door is right there! There’s no arguing with an adventure game text box, I’m afraid. I’ve had the modern King’s Quest games recommended to me by friends in the past – it’s interesting to see the origin story! Yup, this is where it all began. I’ve played the first seven games in the series, so maybe I should give the reboot game a chance soon; apparently, it’s supposed to be pretty good. $850k sounds like a huge budget for an eighties game. I loved adventure games back in the day (point n click mostly) but have never tried any of the Quest titles. Maybe one of these try I’ll try one of the more forgiving remakes you mention. Yeah, I thought that figure was really high myself. I can’t imagine most games back then costing that much to produce. If you’re going to experience the original King’s Quest in any form, the fan-made VGA remake is the way to go. The best part? It’s free. What an odd title. Might as well have called it Quest Quest: Quest for the Quest. To be fair, the game was originally just called King’s Quest. The subtitle wasn’t added until the 1987 rerelease. Still, you have a point. I remember having some good times with the VGA remake, although never got too far into it. The logic of the game’s puzzles isn’t really one I follow. The King’s Quest franchise is one that I really do have a complex relationship. Sometimes, they’re really interesting! King’s Quest IV in particular, I remember really getting into. But yeah, just like with Rumplestiltskin above, sometimes you have to wonder just what they were thinking when putting this together. The thought of cash-grabbing for their paid tips line doesn’t help, either. I don’t think the logic is as bad as it is in other adventure games from the time (i.e. The Hitchhiker’s Guide to the Galaxy), but I can easily see it lose somebody in the worst possible way. King’s Quest IV is honestly probably my second-favorite game in the series, and I find myself in a weird position when it comes to how I feel about it. It has this weird incongruity where sometimes it has incredibly good ideas and then it will have several astonishingly poor ones. I’ll be sure to explain when I finally get around to it, but I can see how somebody could look past its imperfections in favor of admiring what it does well. You know, as much as people (rightly) complain microtransactions these days, it’s a mistake to assume they’re a new trend. As the presence of hint books demonstrated, they tried to get as much money out of their audience as possible even back in what many enthusiasts deem the good old days. If anything, we’re probably slightly better off these days because you can research these bad trends and avoid them whereas before, you just had to sit there and take it.